Disclosure: I was not compensated for this post. I received a sample for review purposes. Opinions expressed are my own. OPI’s newest collection, Spotlight on Glitter, features dazzling metallic and holographic lacquers. It’s always a good time to add a little glitter to your life right? Why only wear it once a year on New Year’s Eve? Now your nails can sparkle and shine all year round. I love the look of pretty, glittery nails especially when they catch the light. You can wear the nail lacquers on their own or layer them over top another colour. I Reached My Gold! : The cache of gold confetti in this clear rainbow glitter is all yours! My favourite colour is Chasing Rainbows. I wore it in the days leading up to St. Patrick’s day. I figured it fit the theme quite nicely! It has a clear base with a dusting of pink, silver, green, orange, and even yellow sparkles in different sizes. I went out for a coffee and noticed my nails sparkling as the sun hit them. They looked like diamonds! You can use these nail lacquers with another new product from OPI called Glitter Off. I’ll also be sharing more info on that one shortly. 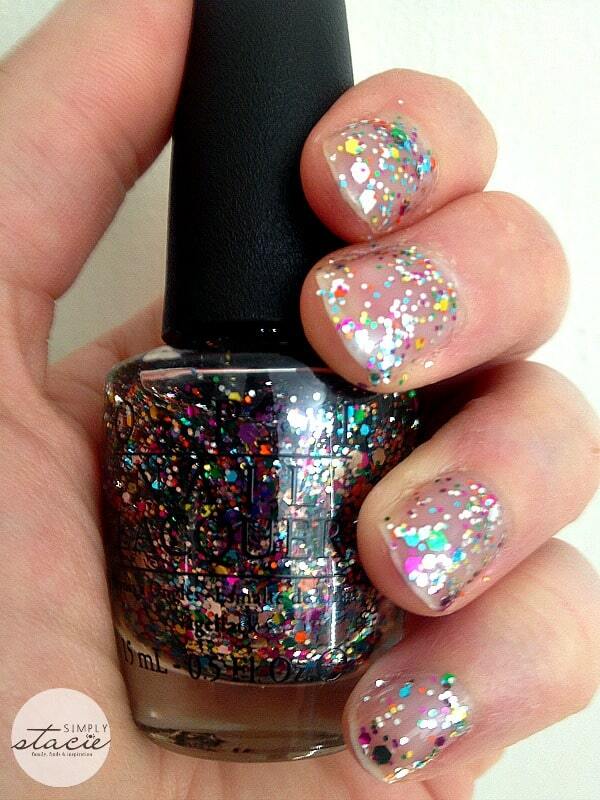 It’s a new, peel-able base coat that allows you to quickly and easily remove your glitter lacquer. It’s applied beneath any glitter shade. I’m hosting a giveaway for the entire Spotlight on Glitter Collection so make sure you enter! Spotlight on Glitter is now in professional salons and spas across Canada and have an SRP of $10.95/each. Which shade will you wear first? This is nice like to try this. This is so cool. I love OPI nail polish. It’s good quality polish and lasts on my nails. I would like to try this polish to add some sparkle on my regular polish. I have the red glittler and vintage pink glittler ones and, as all OPI nail polishes, thery are amazing! 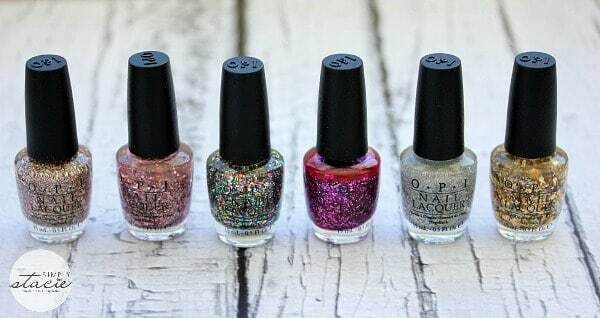 These are gorgeous colors, I am a nail polish addict – I love this brand too, it’s pretty much the only one I stick with or need, they offer everrrrything and these glitters are way too cute, love them! I love this collection and OPI makes the best nail polish! OPI is the best! I love these colors. I think these colors are really pretty. My fiance loves nail polish and I think she would like these colors. She used to get her nails done at the salon last year, but my back caused me to lose my job, so hopefully when I get my disability payments straightened out, we will have enough money so she can get her nails done again. As soon as I heard about this collection I knew that I needed it. Glitter is my favorite! I love all of them! I love a little glitter sometimes! These are really pretty colours! This Spotlight on Glitter collection is amazing, I love all of the colors, it’s the perfect collection. Thank you for sharing this review. I have avoid the glitter ones for a number of years because they were so hard to remove but I see that you mention an OPI glitter off which I will be looking for! I love the Blush Hour color. Glitter makes everything extra pretty.